Want the latest young adult news and events? 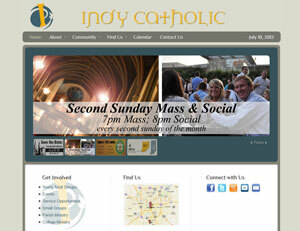 Then come visit us at our new website: www.indycatholic.org! There you will find a information about the latest Catholic young adult events taking place in the archdiocese, as well as ways to connect with us. And don't forget service opportunities! We believe that God will continue to renew the Church through the Catholic Young Adult Community of Indianapolis – and we renew the Church by renewing ourselves. Pope Benedict XVI tells us in his encyclical, Deus Caritas Est or "God is Love", "Certainly, one can become a source from which rivers of living water flow. Yet to become such a source, one must constantly drink anew from the original source, which is Jesus Christ…"